If you are a follower of One Lucky Day, you already know about the little desk calendar. What started off as a 7gypsies make and take about 5 years ago, has grown into a yearly post. 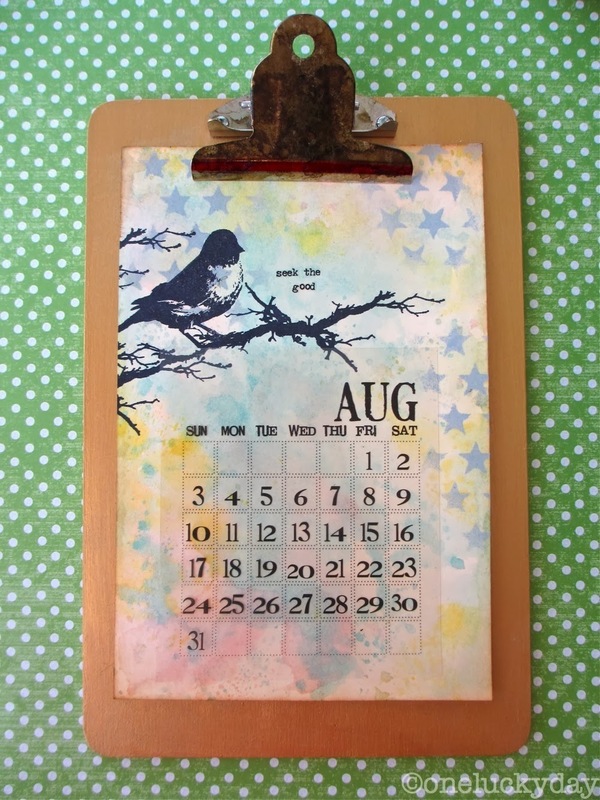 Deb was kind enough to update the calendar for 2014 (thank you) so you can get started early! I always try and have some sort of tutorial for the new calendar. This one is such a good idea that is may just morph into a technique class for the new year. Each year I have printed the calendar on cardstock, so this year I decided to change it up and print on transparency sheets. This is the brand I had here at home which I am sure is years old and probably purchased at Walmart or Office Depot. I printed the calendars using my home Laser Jet printer but the packaging says it works with ink jet too. Once I had the 3 pages printed, I cut them into squares. I also cut Ranger Manila cardstock 5 x 7 1/2" to fit on a small clipboard. I already have enough stuff on my desk, so the calendar hangs on the wall right by my computer. Before starting on the calendar, I painted my little clipboard with Ranger Dabber paint in Gold and Alcohol inked the clip (mushroom and espresso). Set this aside to dry while you make your calendar. I colored the cardstock with Distress Stain - tumbled glass, squeezed lemonade, and spun sugar (and a spritz of water). I used a Layering Stencil to add stars along the edge. The Weathered Wood Distress Paint is super subtle over the Distress Stain. I decided to add this bird from the Urban Tapestry stamp set. You might notice that the branch ends just under the birds tail. To make sure the bird did not look like he was floating across the page, like something right out of Harry Potter...I inked and stamped the end of the branch five more times, to make it look like he is sitting on the branch of a tree just out of sight. A little Remnant Rub message, then add the calendar to the page. I was going to use the Tiny Attacher to secure the calendar but I found that static keeps it in place. You can turn it upside down and the transparency doesn't fall off or even move. I live in CA and maybe we just have a lot of static here, who knows? You can always attach it with the Tiny Attacher, brads, or vellum tape. Now it's ready for display! You can make one background or twelve...whatever you like and have time for. I think this one may be my favorite yet - what I need combined with what I like. When you click on each link, it will take you to a page that contains 4 months of 2014. Click on the arrow in the top left corner to download the file. Depending on your computer, you may need to retrieve each page from your download file and save it to your desktop for printing. Love to see what you make! Thank you! Thank you! ... You read my mind Paula. I was just talking about this yesterday with someone that I made the calendar for as well as the one for myself. Love this version too. wow-----wow!!! Gotta look at the others again---had forgotten how awesome they were!!!!! Thanks! Love it! Thanks for the 2014 calendar and for the inspiration! I wonder how the static will be in Ohio??? LOVE that bird! Such a great idea that would make quick gifts. Dear Paula and Deb--You guys are God-sends!!! I began my project about 2 months ago and due to a myriad of other life happenings, it's been on standby for the past 2 months. But due to your post, I am inspired to tackle it again. It will be soooooo cute. I was inspired by your projects!!! I will be sure to post it once I am done with it! Now greatly looking forward to the weekend!!! Loved the dragonfly calendar last year, made a couple for presents. Thanks for coming up with another great one! please report back on your static findings...that might explain why the garage is a mess. I SURE he heard me complaining, lol. So cool - thanks for the updated version! October always makes me think of the new year's calendar. I'm fairly new to this blog, and I love all your calendars! Thanks for the PDFs of the 2014 pages! glad that you are here Stephanie! LOVE IT! Thank you so much for the inspiration, downloads and great directions! You've inspired me to get a calendar done for myself (and maybe a few gifts!) this year. Really gorgeous project! Fabulous idea for a gift! I like the background, thanks for sharing your with us! You are always inspirational for me and I like your style in every detail of your work! Thanks again for your kind comments on my blog! Love this! Thanks so much for sharing. I have to make a few of these! YAY!! And thank you so much for creating this early!! I still have my original calendar and love updating to the new year, but may give this lovely project a try as well. This is a good one! I started following you last year about the time you did the 2013 calendar and I fell in love with it and now another fun & creative one .... or four! Thank you, thank you. Another winner. Thanks for the early calendar pages. My friends would be lost without updates. You have done it again. Thank you! Thanks again Paula, your calendar is always a hit and I was wondering what you would come up with for 2014. Love your idea for 2014! Thank you for doing this again this year! I love these calendars. Fabulous calendar Paula! Love the bird (that is one of my favourite stamps). I love, love, love this. Using the transparency paper was a stroke of genius! The stamping, stenciling, staining, painting is so beautiful. I think I shall make these for Christmas presents for the fam. Thanks for a great idea! How did you apply the stain to the cardstock? I tried to do it the other night and had horrible results. I'm not sure if it's because of the cardstock I'm using or if it's the way I'm doing it. Please help! Thanks in advance. hi Chelsea, I used Ranger Manila cardstock for the surface. It is thick and has a slick surface which works well with stains and inks. As for the stain, I squeezed out a little of each color onto a non stick craft sheet and spritzed it with water. 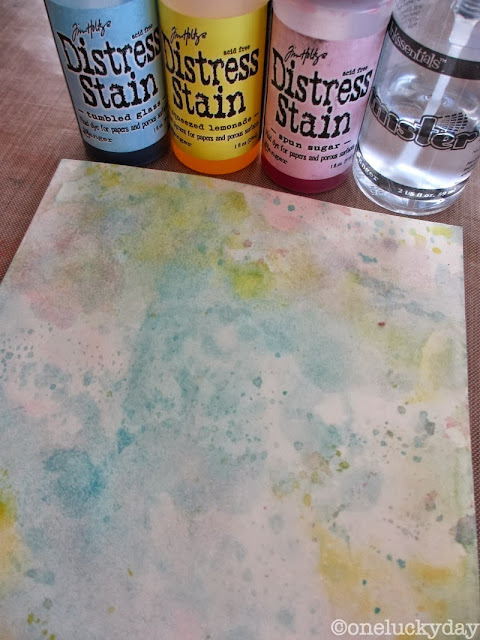 Then, working quickly (with my heat gun going) it pressed the paper into the stain then lifted it up and started drying with the heat gun (blotting off an excess with a paper towel). After about a minute i went back into the stain for another layer of color and then dried it again. This post from a few months ago might shed some more light http://www.oneluckyday.net/2013/03/mini-book-basics-divider-pages.html. Thank you so much for your help and also thank you for getting back to me so quickly! I really appreciate it! Yay!!! found the calendar in your archives-missed it last year-but I'm back now and cant wait to get started with 2014 energy!! !